Despite having spent the best part of three months travelling down the Australian coast, I made pretty good time reaching Victoria for when I had aimed. As I mentioned before I was staying with some family friends, Ollie and Mike, and they were generous enough to invite me to spend Christmas with their extended family: an offer I was glad to have accepted. Surfing Santa. Says it all, really. As you might expect from any westernised country the lead up to Christmas was a big thing, and I first saw big decorations being put in place when I was back in Brisbane a month earlier. Presents and toys were a big theme, something capitalised on with a rather festive Lego display in Sydney, but it was during my few days in Melbourne just after travelling on the Great Ocean Road that I saw citywide decorations in full swing. Of course travelling is all about new experiences, and taking in the sights of polar bears, igloos, and Santa’s elves wearing shades was, to me at least, certainly a novelty. I might have been far into the southern hemisphere, but the North Pole rhetoric of Santa Claus was as alive and well as back home. Even the street art was festive. For those who haven’t experienced one, an Australian Christmas is pretty much what you might expect, or at least what I was expecting from hearing about other peoples (plus maybe a few stereotypes thrown in for good measure). Firstly this included chilling out in the sunshine (and shade, complete with Slip, Slap Slop, routine) while before the finishing touches were added to the Christmas dinner. Something was similar to a British BBQ menu of burgers, salads, etc, but being cooked in Australia was a little bit more exotic. Luckily those with more experience were able to teach me exactly what to do with my King Prawns to make sure I didn’t eat the parts I wasn’t supposed to. In addition, rather than a traditional nap the after dinner routine consisted of relaxing in the pool rather than on the sofa. About as relaxing as you’d want spending an afternoon in the pool to be anyway, as the inclusion of water pistols is always a welcome one. Thanks to Ollie for the photo! Over all it was a Christmas I shall never forget as it is one which most reminds me of what Christmas is supposed to be about. Not presents or snow, but spending a day with wonderful company in such a welcoming atmosphere, regardless of what side of the world you are on. After spending a great week enjoying the comfort and hospitality of several Australian households however, on new year’s eve I headed back to the big city. Melbourne was about two hours away by coach, and I’d booked myself into the north YHA. Primarily as the main hostel in the Central Business District was fully booked, but as luck would have it this actually gave me an even better experience. The trek to get there was a bit further than literally just around the corner from Southern Cross Station but did take me past the Queen Victoria Market, one of Melbourne’s more traditional features in contrast to it’s built up CBD skyscrapers. Something which this YHA’s location gave me an unobstructed view of. A tale of two rooftops. Having grown up surrounded by countryside I’ve never been a huge city person, and as much as I have enjoyed visiting them, to me they’re always at their best when lit up at night. Melbourne achieved the pinnacle of this on this particular night, as I stood enjoying a firework display that covered an entire cityscape that was lit way above head height and was shooting off even further into the sky. Something which was highlighted by the fact that although I was travelling by myself, staying in a hostel ensured that meant I didn’t spend it alone, and toasted in 2015 with a lovely German couple who treated me to a glass of Champagne style sparkling wine. The humble rooftop terrace of a three storey YHA might not have been tall enough to join in with these firewors, but I’d have struggled to have found a better place to watch them. When planning my journey of Australia’s east coast I specifically chose to travel south for a number of reasons, the main one being that I would here during the summer. Australia is generally hotter than back home regardless of season, and I didn’t want to be confronted by heat squared; heading into the summer, AND towards the tropics. Another reason is that I also have a few family friends down in Victoria who I wanted to visit. Unlike my big trip to North America 10 years ago which I began by visiting friends, this time I wanted to jump in on my own first, and then meet them as part of my journey. And so it was that the end of my East coast road trip took me to Victoria’s Bass Coast. I first met Ollie and Mike when they moved just around the corner from me about 15 years ago. Despite being young at the time, and they closer to the age of my parents, I still enjoyed spending time with them and hearing their exotic tales of life on the other side of the world. They also got on well with my parents, and would often tell tales of their British exploits together when introducing me to their own friends and family over here. I spent a week with them and they showed me the sights of their local area, somewhere not generally visited by backpackers due to being off the main tourist trail. This was a welcome change and allowed me to experience a slice of life in ‘actual’ Australia; whereas I had spent weeks meeting almost exclusively other travellers, now everyone I met actually came from the country I came to see. It was also nice to spend time in some spectacular places and not have to share them with too many other people. In addition to this Mike had previously worked for Parks Victoria and was very knowledgable about the area. This meant I had the best of both worlds of being shown round by both a friend and tour guide. A disused Lime Kiln. Or what’s left of it. We went on several hikes, the first along the George Bass Coastal Walk. We drove to the Punch Bowl and walked the first section together, which included some great coastal views, people ignoring the no fishing signs on the rocks (as well as the don’t go on to the rocks signs in general), and a rather unique pink and triangular house that despite being architecturally impressive, stuck out like a sore thumb. 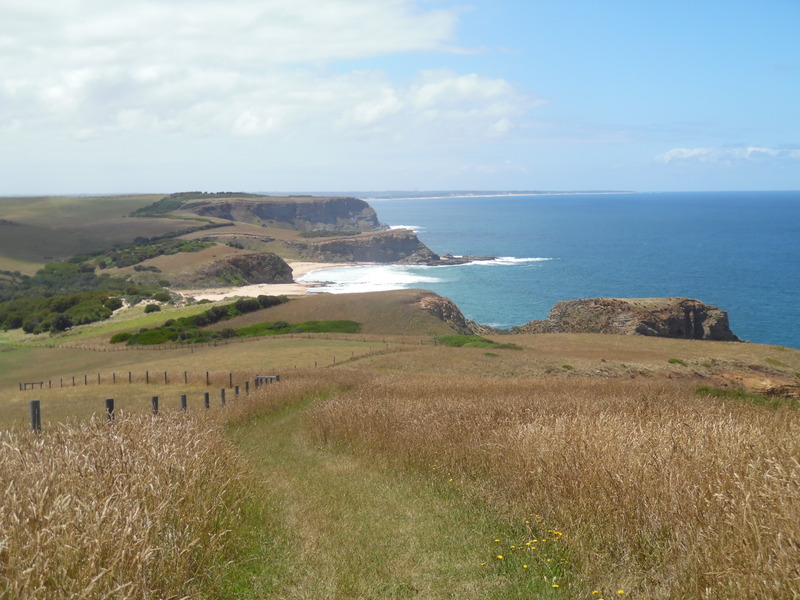 I then continued along the trail on my own, taking in the scenery of the hills, beaches, and cliffs, and making sure the proper Aussie hat that Mike very kindly gave me didn’t blow off in the wind. 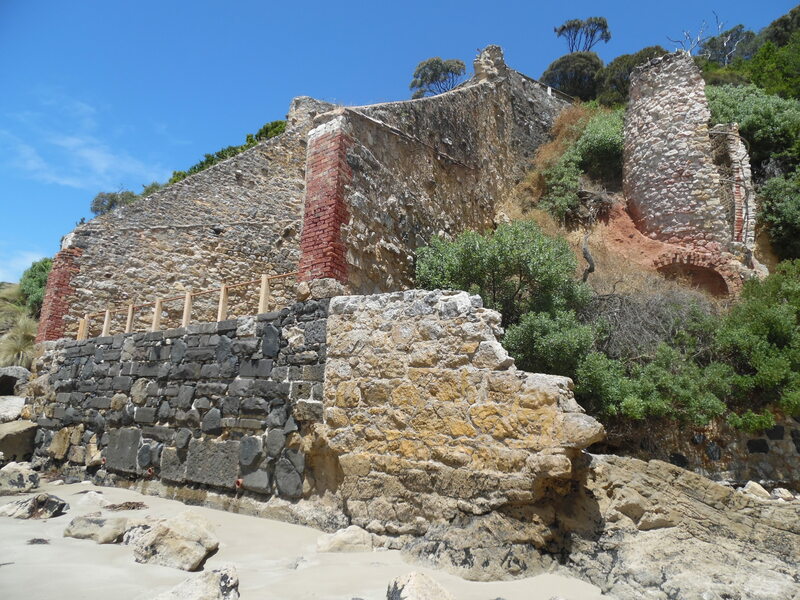 Another similar trip took us to the aptly named Walkerville where we ambled along what remains of the Lime Kilns, and we also went for a bike ride along the Bass Coast Rail Trail. I have to admit I was somewhat surprised at the presence of a rail trail in Australia. Although I have walked on the similar Tarka Trail back in Devon, I had mistakenly figured that the western history of Australia didn’t go far back enough to cover the building and dismantling of the railway lines. The Bass region had previously relied on railways to transport the materials being dug from the mines however, which were no longer operational and now only open to visitors on day trips. Better than a mole digging up your lawn. One of the biggest highlights however, like the rest of my trip, was the wildlife. 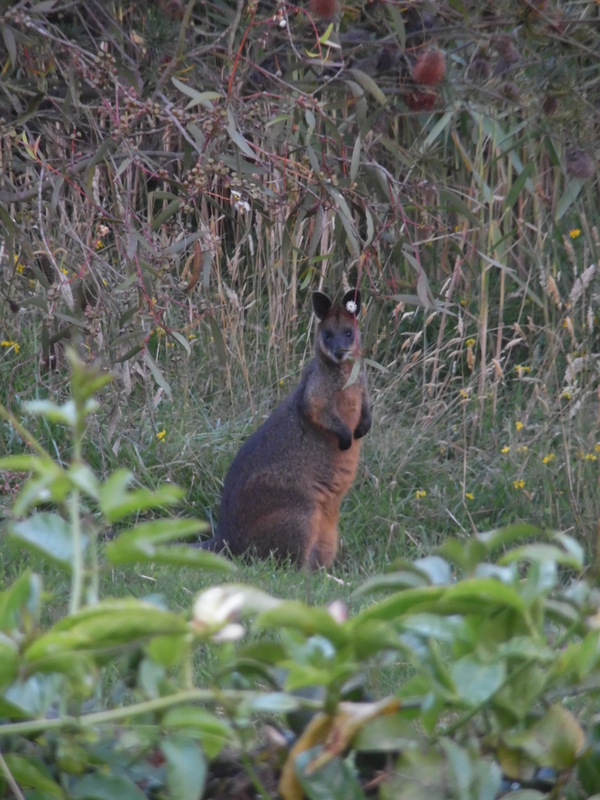 In Mike and Ollie’s garden alone I was lucky enough to see an Echidna, Wallabies, Wedge Tailed Eagles, and Possoms living their nests. Driving around we also saw a mob of Kangaroos, although unfortunately the only Wombats I saw were dead at the side of the road, but you can’t have everything. In true Australian style I also got bitten during my time here, but luckily it wasn’t the magnificent Huntsman spotted by the front door. Bull Ants aren’t that bad, and it’s not like I hadn’t been shown/warned about them beforehand; really it was my own fault for walking through the grass barefoot.